This campaign ended on April 26, 2018, but you can still make a gift to University of Indianapolis by clicking here! Andy Kocher gave $100 because 100 donors made a gift in 2 days. Norma Hall gave $200 because 200 donors made a gift in 1 day. Kory Vitangeli gave $200 because 100 donors made a gift in 1 day. Help us reach our goal of 500 donors by sharing your personalized link (see Advocates tab) with family and friends. When you generate one donation, we will send you a UIndy alumni decal. Become an Advocate by spreading the word about #UIndyDay. When you generate three or more donations, you will receive a handwritten thank you note from a current student. Click the 'Advocates' tab to get started. If your advocacy efforts generate five donations, you will receive one free entry into a UIndy Alumni Association event! You'll also receive a special social media shout out on the UIndy Alumni Association Facebook page. Share your pride in style. Advocates who generate 10 or more donations will receive a UIndy T-shirt! Take your advocacy to the next level! Generate 15 donations on UIndy Day and you’ll receive an invitation to join President Robert Manuel at the Stadium Club for any 2018-2019 football game. 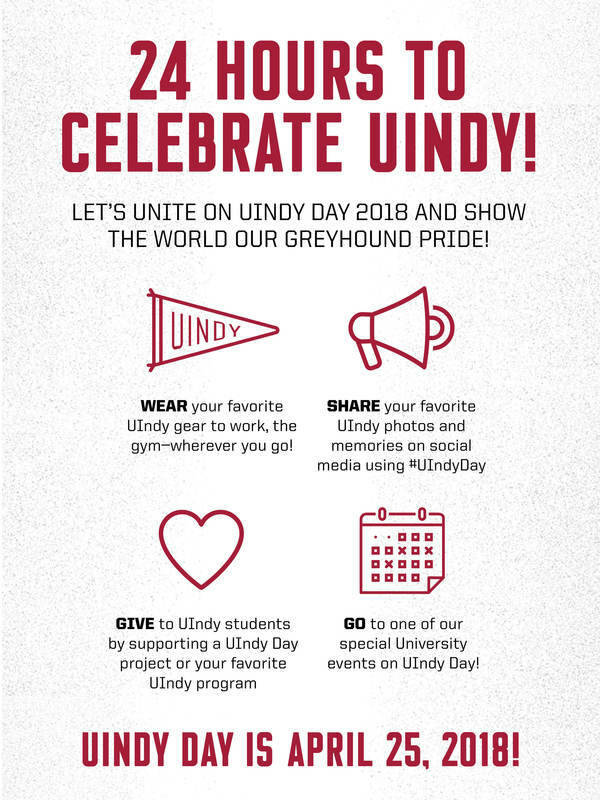 Let's unite on UIndy Day 2018 and show the world our Greyhound pride! Scroll down to see the UIndy Day fundraising projects and other ways to celebrate with us on this special day. Held on April 25, 2018, UIndy Day was a day to celebrate our Greyhound pride with a focus on sharing UIndy spirit on social media and supporting students. you can still make your gift! Join us as we strive to reach 500 donors in 24 hours. Make a gift today to support one of the following exciting and important projects. Plus, President Robert Manuel will match $1-for-$1 donations from the classes of 2013-2017 up to $1,000 per class. Since its construction in 1904, Good Hall has served as an iconic presence and cornerstone of knowledge for every student, alumnus/a, and community member who has passed through its columns. Today, Good Hall represents the strength and history of UIndy’s liberal-arts core education and will soon be the home to the Shaheen College of Arts & Sciences. Renovations are currently underway to restore the building’s two-story portico and six columns at the main entrance and update interior classrooms, faculty offices, and collaborative spaces that will transform student experiences. Your support of the Good Hall Restoration will touch every student who walks through its halls in pursuit of a UIndy liberal-arts education. Thanks to a generous donation from University of Indianapolis Board of Trustees Chair Yvonne Shaheen, your gift to restore Good Hall will be matched 2-to-1 up to $500,000. Building a finance lab will give the University of Indianapolis an advantage over 80 percent* of business programs in North America, leading the School of Business into elite stature with the latest technology, cutting-edge curriculum and the Wall Street feel that’s essential in today’s market. New equipment, such as a stock exchange ticker and industry software will provide a classroom with the look and feel of a New York brokerage house trading floor. This experiential learning allows students to transition more seamlessly into careers in finance with skills that employers need. Your gifts will help us provide more scholarship to students, strengthening our generous financial aid program. Scholarships support continued academic excellence and diversity, making a UIndy education accessible to any talented, qualified person who seeks it. Ninety-six percent of UIndy undergraduate students receive some form of financial aid. Your support could be the deciding factor for their future as a Greyhound. Help us honor two pivotal members of UIndy’s Athletic Training Program while also supporting UIndy MSAT students! Ned, UIndy’s current Head Athletic Trainer, has been inspiring UIndy students for 25 years, and Connie, though retired since 2013, is still an active member of our Greyhound community. The Ned Shannon and Connie Pumpelly Athletic Training Fund will support students by providing funds for items such as students’ BOC (board of certification) exam fees.Your gift will help students realize their dream of becoming a certified athletic trainer while honoring Ned and Connie. Plus, an anonymous donor and the athletic training faculty believe in the power of gifts to the fund so much that they will match gifts given to this effort 1-to-1, up to a total of $14,000! The University of Indianapolis Department of Criminal Justice is celebrating its 45th anniversary this academic year, making it one of the longest-running criminal justice programs in the state. Demand is growing for criminal justice graduates and the University has responded with exciting new opportunities within the major. The program has expanded to include loss prevention and cyber security tracks and a crime scene investigation (CSI) track will be offered in fall 2018. A new Criminal Justice Education Lab located near campus will provide space for training simulations for criminal justice students as well as city police departments and investigators. In celebration of the 30th Anniversary of the Etchings Literary Magazine, make a gift to support the Etchings Press—UIndy's student-run publisher. When you make a gift of $40 or more, you are eligible to receive benefits (valued at $25) including the most recent editions of Etchings Literary and Fine Arts Magazine, and the most recent winning chapbooks in poetry, prose, and novella from Etchings Press. Be sure to sign in or log in on the 'Advocates' tab and share your unique links to encourage your friends to support a project. When you do, you could earn one of the many incentives for generating gifts on UIndy Day! See sample posts, download images, and more by visiting our social media toolkit!